My Speller answers the age-old question of how to look up a word you don't know how to spell! Based on the theoretical foundation of the revolutionary Phono-Graphix® method, My Speller Dictionary reveals the surprising logic of English spelling and teaches spellers how to internalize the complex English written code as the use it. For the first time, aspiring spellers can access and store spelling information in a sound-based manner, not the letter-based system of traditional dictionaries. If you can speak a word, you can find out how to spell it! Entries include the entire Dolch 3rd Grade list and more than 750 words frequently used by children in their studies. 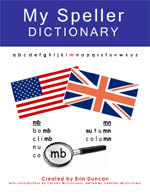 Both American and British pronunciations are presented, and My Speller Dictionary even accounts for dialectal differences and non-standard pronunciations that can confound children and teachers alike. Space is provided to add new spellings for sounds and new words as children find them, creating a framework with vocabulary they actually use, and putting them in the role of active participants in the discovery of the Engish code. Also included are more than 20 pages of instructional guidelines on teaching spelling "Phono-Graphically", how to render the English written code fully reversible, and insightful contributions by Phono-Graphix® program developer Carmen McGuinness.